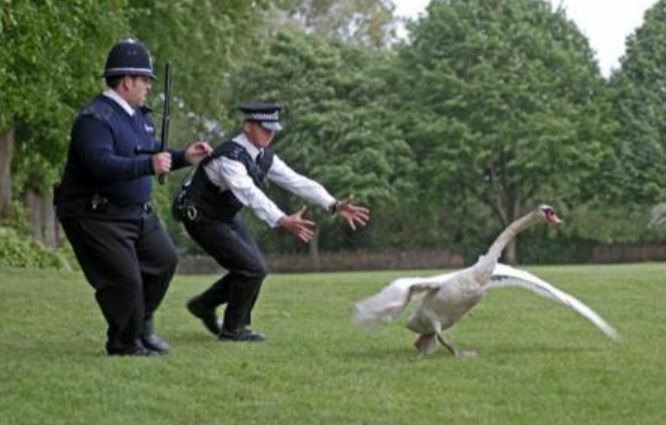 Hot Fuzz became a reality recently as a couple of police officers had no luck catching some escaped swans. 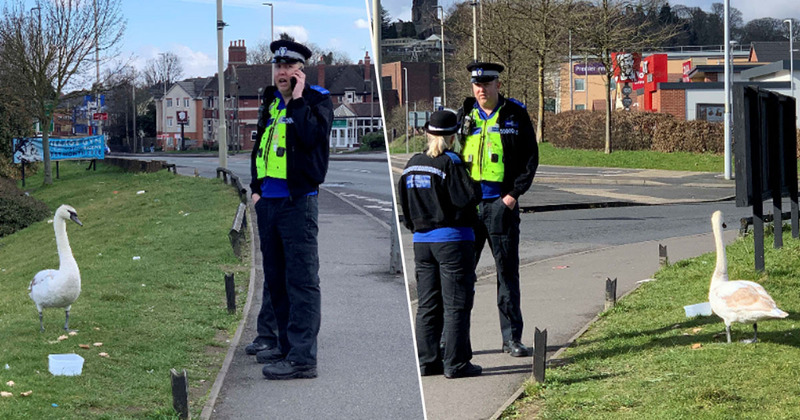 The police community support officers were spotted channeling Sergeant Angel and PC Danny Butterman in Dudley, West Midlands last Saturday, when a passerby drove past and caught them in a stand-off with the bird. 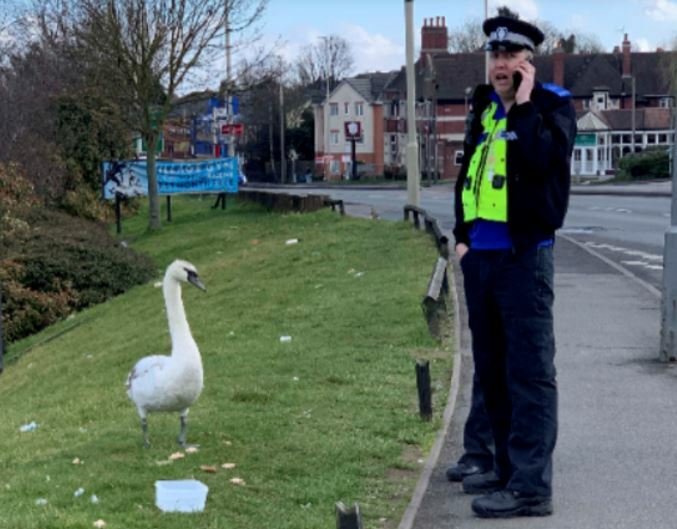 Just like in the film, one of the officers appeared to be calling for backup, probably after his swan-honking sounds failed to entice the bird into his arms. We can only assume the swan had escaped from the castle and was called in by a Mr Peter Ian Staker – aka p*ss-taker. It had probably been taunting the officer for days; always managing to escape his grasp. As best described by Mr Staker, the bird in the photo is about two foot tall, with a long slender neck and a black bill… so basically your average swan. I was on my way to do some shopping and I pulled over to take a picture. It reminded me of that funny scene on Hot Fuzz. The fact there’s an escaped swan wandering around could be a worrying sign that Dudley will soon be overcome with murderers in cloaks, but if that happens at least the officers will know to head straight to the castle to find the culprits – and I’ve checked, there actually is a castle in Dudley. 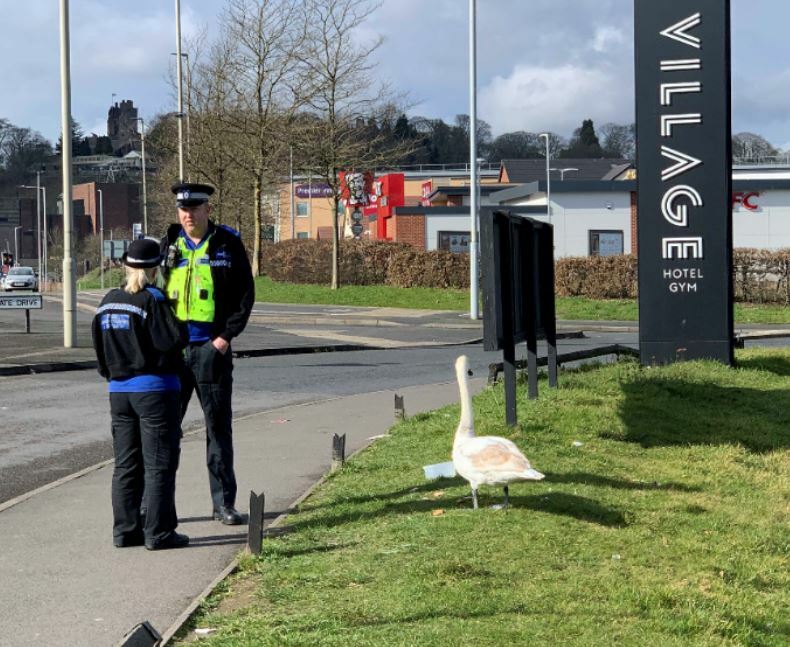 It’s not clear whether the officers managed to catch the swan, and if they didn’t, of course there’s only one thing we have to say about that; no luck catching them swans then? But hopefully the capture was successful, and the officers rewarded themselves with a nice Cornetto afterwards.